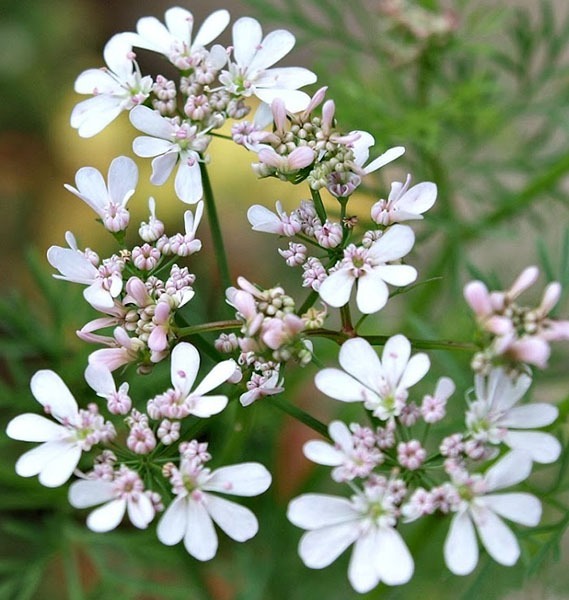 Herb with a fistular stem, leaves, alternate, generally compound or much incised, inflorescence a typical compound umbel, flower actinomorphic, hermaphrodite, epigynous, pentamerous, calyx 5 sepals, corolla 5 free petals, stamens 5, bicapillary, inferior ovary. Some important genera are Coriandrum sativum, Carum carvi (kala zera), Cuminum cyminum (Safad zera), Foeniculum vulgare (Saunf). Erect, cylindrical, weak, herbaceous, fistular, branched. Cauline and ramal, alternate, exstipulate, sessile, sheeting leaf base, compound, deeply incised 2-4 pinnate. 2-3 lobed, linear, entire, acute, reticulate, unicostate, glabrous, herbaceous. Compound umbel, involucres abd involucerl present. Ebracteate, pedicellate, complete, actinomorphic, hermaphrodite, epigynous, cyclic, pentamerous. 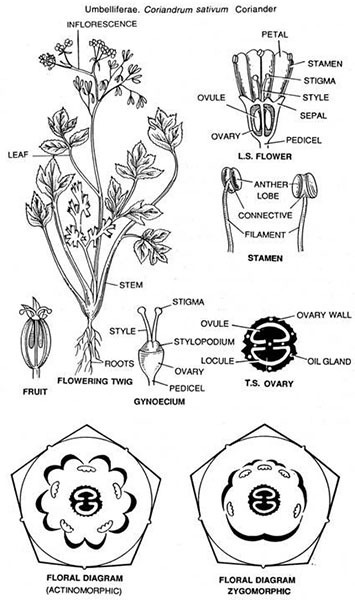 Five sepals, calyx tube adnate to the ovary, gamosepalous, calyx teeth 5, small, unequal, slightly petaloid, superior. Five petals, polypetalous, white, superior, inner or the posterior petals are smallest and lobed, the anterior is largest and deeply bilobed, two lateral are medium sized and unequal bilobed. Five stamens, polyandrous, filament long, anther dorsifixed superior. Bicarpellary, syncarpous, ovary inferior, a small fleshy nectar secreting disc lying above it form the nectar, bilocular with in pendulous ovule in each loculus, style absent, stigma two, arising from the disc. Floral Formula: K(5) C5 A5 G2. Following are the economic importance of the family. 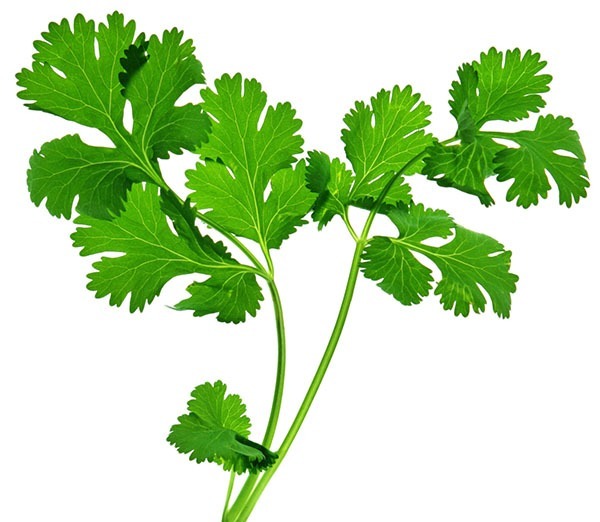 Carrot (Daucus carota), parsley (Petroselinum sativum) are the chief members, used as pot herbs. Several members of the family are important as forage plant for cattle and horses. Of these carrot, Heracleum spp, Angelica spp, etc. Ferula (Hing), Carum (Ajwain), Cuminum (Zira), Corandrium (Dhaniya) are used as condiments. These plants contain volatile oils which may be used for fragrance. Ajwain, Hing, Sowa are used as drugs. Hydrocotyle (Brahmi) is used for brain work. 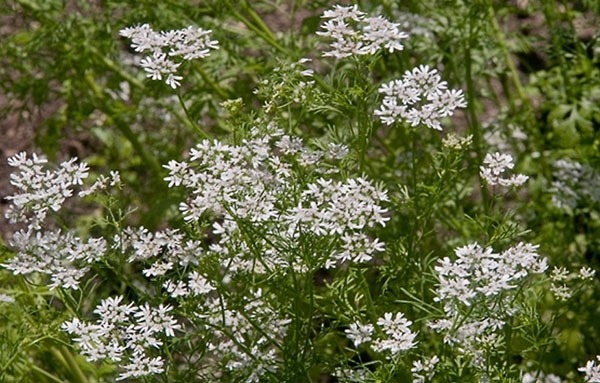 Several plants contain acrid juices which are narcotic like Conimu (Hemlock).